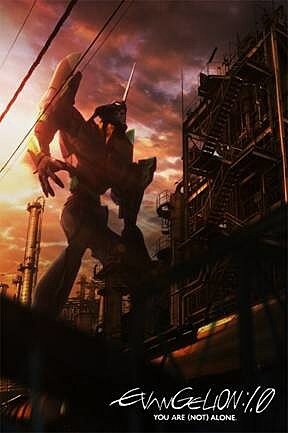 Upon its original release, the anime Neon Genesis Evangelion hit like a comet in both America and Japan. It critical and commercial success was quickly exploited across what feels like every single medium possible. Now, over ten years later, we're in the midst of "Rebuild of Evangelion." Part remake and part recreation, this is director Hideaki Anno's attempt to create a version of Evangelion as he originally intended in four all-new movies. After watching both movies currently out in the United States and Japan, we offer you our review of Evangelion 1.0: You Are (Not) Alone, available now on home video, the recent theatrical debut of Evangelion 2.0: You Can (Not) Advance, and why it's worth seeing the second even if you didn't like the first.Generally, how much you like Evangelion is dependent on when you watched the original TV series. If you got to it in that sweet spot of being a disaffected teenager but before growing up, you probably love it. If you came to it a little late, you probably find Shinji Ikari, the main character, annoying. It turns out that that's the problem with Evangelion 1.0, as well. Rather than playing well as a movie in and of itself, 1.0 feels like an incomplete Greatest Hits version of the first six or so episodes of the television series. We get familiar scenes, such as Shinji running away from Misato's apartment and riding a train, but they only last a short period of time. They're so brief that they have practically no emotional punch. As a fan of the old tv series, I get a lot of the references and throwbacks, but none of it feels like it matters. 1.0 feels insubstantial and poorly-paced, even to a fan. 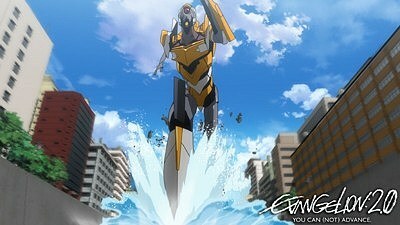 Evangelion 2.0 is much better, for the most part. It stops sticking quite so closely to the original series, instead ramping up the action sequences and interpersonal relationships in believable and actually kind of wonderful ways. "Rebuild" is Anno's third try at Evangelion, and it seems like he is finally interested in creating characters who both enjoy each other's company and behave like, you know, actual people. There are a few genuinely sublime scenes that are full of actual human warmth, something that was missing from a lot of the TV series and much of 1.0. In breaking away from the original series, 2.0 manages to become even more interesting. Rather than being a straight remake, there are very, very strong hints that it is something more than just another at-bat for Anno. Characters know new things, behave differently, and most of all, actually seem to like one another when appropriate. 2.0 is refreshing, rather than cold. The new addition to the cast adds an interesting layer of mystery, as well. At least two things both movies share are extremely high quality animation and action sequences. Anno has taken advantage of the increased budget and new format to beef up what really makes Evangelion go: giant robots beating the bone marrow out of other giant organisms. The Evas look great, and the introduction of Unit 02 in 2.0 is the kind of high-flying, death-defying action that makes these types of movies worth it. It's an action scene that's visually interesting and extremely cool. The Angels have been mostly redesigned as well, this time becoming even more geometric in shape (perhaps evoking a bit of sacred geometry?) or even more bizarre. Sahaquiel, the Angel that fell from space to attack NERV HQ, is the center of a much more involved battle that features robots breaking the sound barrier, stunning landscapes, a host of growths that look like entities engaged in worship, and a great finish. In the original series, this battle was two minutes long. In the movie, it's closer to seven. The extra five minutes make quite a difference, and result in one of the finest sequences in the entire movie. The ideas present in Evangelion have always been a little more interesting than the actual execution. With "Rebuild of Evangelion," Anno and crew have much, much closer to making things balanced. The action positively sings, and you begin to genuinely care for the cast, rather than just knowing that you should be caring. On top of that, it feels a bit like "Rebuild of Evangelion" is adding the Tetsujin-28-style wish fulfillment back into the series after being wiped completely clean of it in the television series. We meet a character who enjoys piloting her Eva, and Asuka's introduction sequence is fantastic. Rather than Evas being a harbinger of misery and depression, it feels almost like they're being used to bring people closer to each other. The emotional coldness and distance that plague the first movie have been reduced in the second, and while it may not be completely clear for first-time viewers, lapsed fans and open-minded newbies will find it entertaining, if a bit opaque in certain areas. While I'm not quite sold on Evangelion 1.0: You Are (Not) Alone, viewing that and Evangelion 2.0: You Can (Not) Advance in relatively quick succession made for a pretty fun viewing experience. You can find 1.0 on home video as Evangelion 1.11: You Are (Not) Alone, while Evangelion 2.22: You Can (Not) Advance hits your local retailer in March. Just make sure you check out the post-credits sequences.